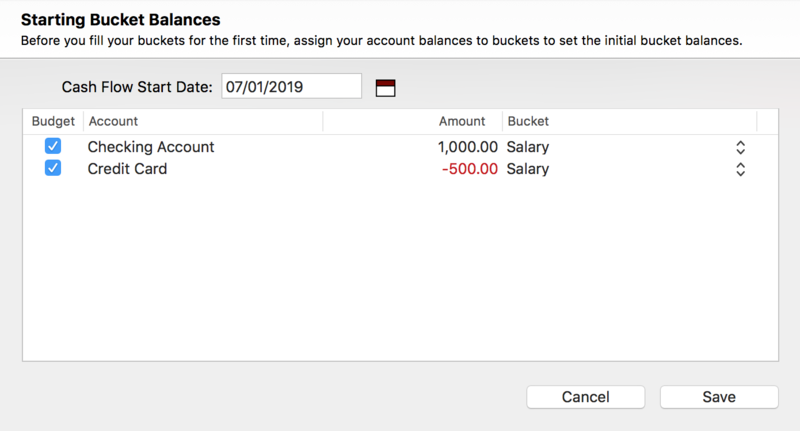 Before you can begin using the buckets in MoneyWell to manage your cash flow, you need to match up the balances in your accounts with the balances in your buckets. This step is necessary because very few of us start with a zero balance in our accounts when we start to do our budgeting. If you started by just assigning your next paycheck to your Salary bucket, the difference between what was available in that bucket and the balance of your account that holds that deposit would be confusing. You wouldn't know which to trust. You can view or change your starting bucket balances by clicking Cash Flow > Set Starting Bucket Balances. The first thing to do is set your Cash Flow Start Date. This date tells MoneyWell when you want to start tracking your cash flow. The best date to put here is the first day of your current budget period. For example, if you are using a monthly spending plan, use the first of the current month as your start date. Each account in the table will display the balance for that date and you simply need to specify a bucket for each account. Click Save when all the accounts are assigned to buckets. If you have a savings, credit card, loan, or investment account that you don't use as money for your day-to-day cash flow, then uncheck the checkbox in the Budget column next to the account and MoneyWell will ignore that account balance in your cash flow total. You only have to set your starting bucket balances once. If you decide down the road to change your cash flow start date because you haven't been tracking your balances well or just want a clean start, you can use it again. There's no harm in resetting it, but there's no need to do it every period. Once you have your initial bucket balances set, you will use Fill Buckets to transfer your income to your expense buckets so you can spend it. How Does MoneyWell Reset Bucket Balances? There is no need to reset the amounts at the beginning of each period because you might really have money in that bucket that you need to keep in it. This is especially true for long term expense buckets like Gifts, Vacation and Taxes.